Anyway, it a very nice shot great details, wonderfull colours. I would like to know you use what type of lenses to made this macro shooting? Deze is wel fraai hoor! Prachtig met de scherptediepte gewerkt. Mooi van scherpte en van kleur. De stuifmeel is een leuk extraatje (het paren natuurlijk ook ;)) Bedankt! Fine image of mating pair of these interesting insects, lovely image. tfs. A great macro with fine details, colors & sharpness. Well done & TFS. Erg mooie scherpe macro in prachtige natuurlijke kleuren. Uitstekende diepte en compositie. Dit was een echte voltreffer. Impressive capture of a very nice couple. Excellent clarity and colors. It is a interesting image taken from a very nice and low POV and with exceptional light. The details and sharpness are great. This is a fantastic macro picture. Sharp focus and the light is well balance. Nice pov and well composed. A superb macro with excellent clarity,excellent sharpness,splendid light and wonderful natural colors. I have never met two hoverflies. It is really a rare shot. Sharpness is great and I like wonderful colours. Lights and shadows so much too. WS is brilliant. TFS and best regards. Ciao Laurens. Great light for E tenax in mating. Excellent details and sharp. 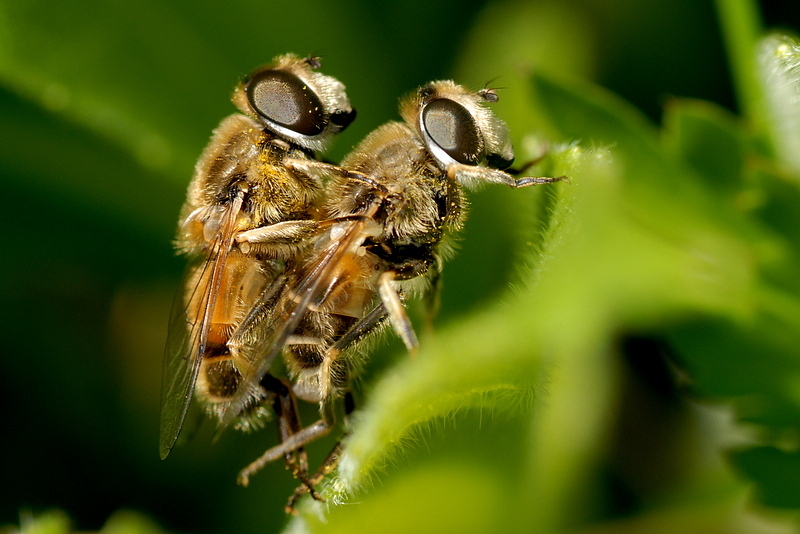 Vary rare photo of this mating Fly sp.ERISTALIS TENAX, congratulations! What an impressive macro shot! Details are incredible and brightness is wonderful!! Great DOF, which isolated the subject perfectly. I also like the WS version. It must be springtime!! :0) Well done! Very impressive macro.Perfect POV and composition,impressive sharpness and wonderful colors.Congrats! This is an amazing shot of the copulating flies. The details and natural tone are so pleasing. Thanks and have a nice day. Interesting subject and impressive macro with good composition, wonderful colours and good sharpness. fine capture of these mating bees with good sharpness and a well chosen POV. I also like your timing and the beautiful colours. very lively view of the fly and the hairy details are excellently presented. The macro shot is superb and the moment is well timed.